It’s been five days and the leaf prints I have been working on produced some striking results!. They are really time consuming and unpredictable in their outcome, however. I will put up an album with final works in the near future but I am unable to replicate in photograph the metallic sheen and luminosity that bounces off some of these gorgeous prints. While working on these, I definitely made some mechanical errors (like weighting down the prints far too long in too great of heat, producing some fusion of materials that made it impossible to use some of them). Next time, I’ll know to work with fewer sheets, remove the weights quicker, and allow each to dry individually under lighter weights. Once the prints dried, I sorted them all and pulled out the “frame-worthy ones” which either were prefect as is or required some simple outline work with paints and fine markers to punch them up and make the subject pop. Final step is selecting mats. The picture above shows two mats I had on hand and was just tooling around with them to check how they’d work around some prints I had completed. I will need to purchase a mat cutter before too long. Any suggestions readers? Back to process: those prints that aren’t deemed “standalone frameworthy,” I either incorporate into abstract work, as in the photo to the right, or will use in collage work. Toward that end, I’ve been collecting and categorizing scraps, other materials, washi, and other papers. Barring any unforeseen circumstances, this weekend is it for collage work. Can’t wait! Contemporary artist, seeker, writer. Curious to a fault. I let the fates take me and never say no to an adventure. That has led me on some heart-stirring journeys. I regret nothing. 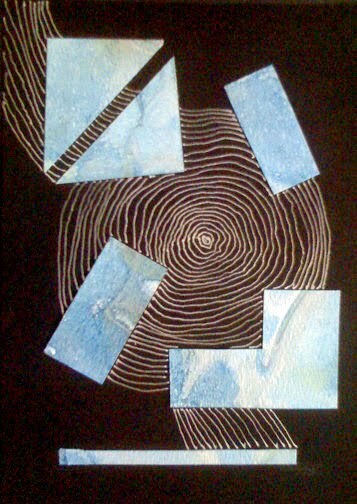 This entry was posted in abstract, collage, leaf print. Bookmark the permalink.